No matter how powerful your pressure washer is, some jobs can only be completed using pressure washer wand. These wands extend your area of reach such that if you are cleaning high places such as gutters and second story windows, you’ll have better reach off the ground. If you’ve damaged your wand or simply looking for an upgrade, this guide will help you narrow down your choice to three of the best extension wands in the market. This guide also outlines some of the benefits of using pressure washer extension wands and how to pick a wand based on your needs. First on our list id the General Pump Shark 87105910. 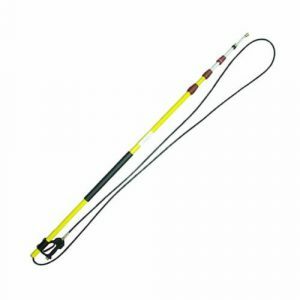 It is a product from Shark Pressure Washers and comes with a variety of features that makes it stand out from other extension wands. For starter, it’s primarily made of fiberglass but has other components within it that are made of materials such as stainless steel, rubber, plastic, and brass. The 87105910 extension wand can be used for a variety of tasks including cleaning cars, high walls, roofs, driveways, pools, gutters, etc. It weighs only 13.7 pounds and measures 7-feet when retracted and can shoot water up to 24-feet. Regarding performance, the 87105910 spray wand can handle a maximum water pressure of 4,000 PSI and a maximum water outflow of 10.5 CPM (Cubic Feet Per Minute). When using this extension wand, make sure the water temperature stays below 195-degrees Fahrenheit. Second on our list is the Raptor Blast extension wand and lance combination. This telescoping wand measures 36-inches when retracted and is capable of delivering performance ratings as follows; it can handle a maximum water pressure of 4,000 PSI, flowing at a rate of 7 GPM, at a maximum temperature of 300°F. What’s more, the Raptor Blast extension wand is extremely efficient with soapy water. You can use soapy water with the wand to achieve better results. This wand also features a safety trigger lock that lets you look the trigger after you’ve finished cleaning to prevent accidental spraying. Regarding connection and ease of use, the Raptor Blast wand features a ¼-inch NPT male inlet plug and a ¼-inch female outlet plug that’s compatible with quick-connect nozzles. If you want better handling and stability, simply insert a high-pressure hose into the pistol grip. Last but not least we have the Apache 99023802 gun kit. Just like the extension wands featured above, the Apache 99023802 is also capable of handling a maximum water pressure of 4,000 PSI. When you are done with cleaning, simply activate the safety trigger lock to prevent accidental operation. 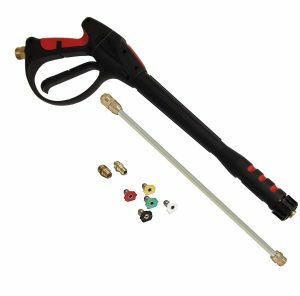 This pressure washer gun kit can be used on both gas-powered and electric powered pressure washers. It is compatible with various pressure washer accessories such as high-pressure hoses, nozzles, and hook-shaped tips for cleaning gutters. The Apache 99023802 comes with a set of 5 color-coded spray tips that have a quick-connect feature. Lastly, the spray wand measures 19-inches when retracted and has a ¼-inch female outlet for maximum compatibility. 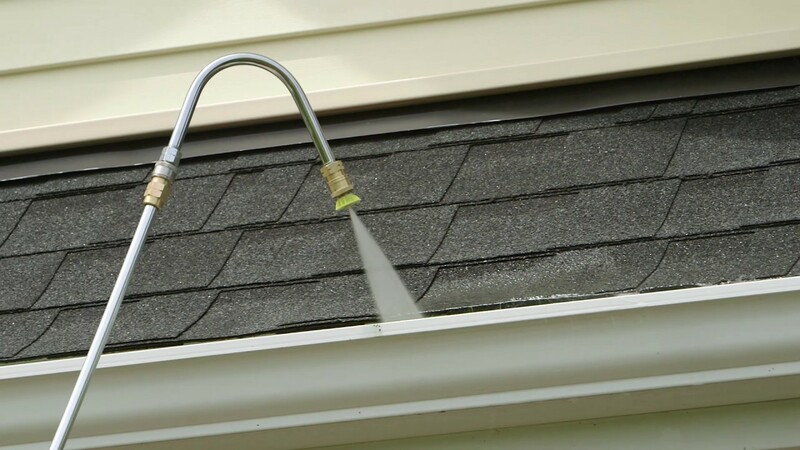 It is extremely dangerous to stand on ladders or any other forms of elevation when cleaning high places such as gutters or second story walls and windows with a pressure washer. There are high chances that you might fall. When you fall, you might land awkwardly on the pressure washer, and the water from the pressure washer might strike you, injuring you and anybody that’s close by. A pressure washer extension wand extends your cleaning reach such that you don’t need to stand on elevated surfaces to clean high places. With an extension wand, you don’t need to stand on unstable surfaces such as ladders, therefore eliminating the risk of fall and therefore enhance your safety. Climbing a ladder or climbing all the way to the roof can be dangerous because it increases your chances of fall. To avoid this risk, you can use an extension wand with a hook-style extension to help you clean your gutters with ease from the ground. The weight of an extension wand plays a significant role when spray washing. It’s likely that you’ll be holding the extension wand over your head for extended periods. Therefore, you need to find a wand that is lightweight as it’s less tiring to use. A good extension wand should be easy to use. Questions you need to ask yourself are; how easily does it connect? How do I adjust it? Do I twist it in a clockwise or an anticlockwise direction? Can I fit attachments to it such as gutter hook cleaning kit? Etc. Also, look at how easily it extends to establish whether it will give you an easy time when cleaning. When pressure cleaning, you need to keep adjusting the spray settings constantly. Determine whether you can easily control the spray settings while pressure washing. Pressure washer extension wands are made of various materials. Wands made of stainless steel are ideal for hot water pressure washers or people that use a lot of soap while pressure cleaning. On the other hand, wands made of aluminum are great for tilting & telescoping extension wands. If you own a residential-grade pressure washer, there’s no point of buying an industrial-based pressure washer extension wand. This is because you will end up spending significantly more on an accessory that you will not make the best use of it and will probably only use it a couple of times a year at best. Also, consider the tip that that comes with the extension wand. 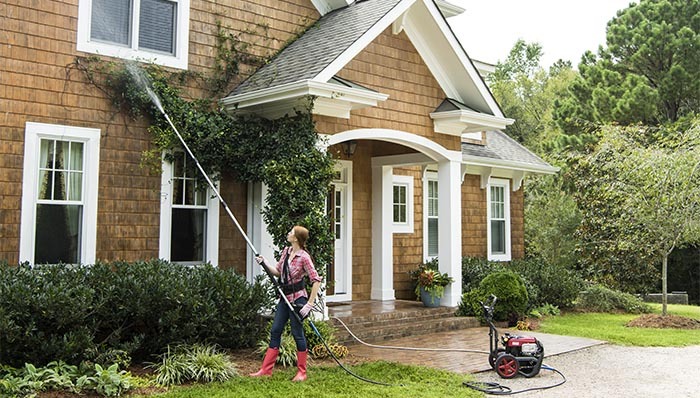 There are two tips involved with pressure washer extension wands; an adjustable nozzle for adjusting the angle of spray and a quick-connector for changing the spray pattern frequently. If you are still not sure which pressure washer extension wand to invest in, the best course of action would be to look at what your neighbors use. Ask them about their wand, how effective it is, its weight, and its ease of operation. You can go a step further and look at its build materials and even test it out on both your neighbor’s and your pressure washer. This will give you a better sense of the wand and help you determine the exact features you need in an extension wand.